It's every festivalgoer's worst nightmare: a dead phone battery. Thankfully for SXSW 2016 attendees, mophie's St. Bernard pups were on hand to save those quickly depleted device batteries (and lives? Hello, social-media obsessed Snapchatters). As in years past, SXSW participants needing to be "rescued" from the plight of low battery power could dispatch a St. Bernard to help them recharge their gadgets. 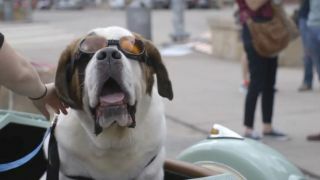 But this year, mophie, the mobile accessory maker, had the slobbery St. Bernards ride along in motorcycle sidecars from the just-established mophie Bad to the Bone bar. It was all designed to help SXSW-ers stay connected as well as raise awareness for the St. Bernard Rescue Foundation, which helps find loving homes for the breed across the US. Here's how it worked. The pups cruised around, equipped with the latest mophie power reserve and ready to deliver juice to those desperate for battery life. People needing a #mophieRescue team during the event sent out a tweet. If determined to be in genuine need of rescuing, tweeters got a tweet back in response, with a link to the Glympse interactive map tracking each St. Bernard in real time. It was a clever activation and brilliant marketing. The pups, who are celebrated for their heroic rescues of trapped mountaineers, were now cuddled in Austin, Texas. It was like Alps, minus the snow-capped mountains, and way nerdier. Plus, you got to snuggle with your rescue pup after it salvaged your battery. "In all honestly, we really just wanted to play with the dogs again for a few days," said Ross Howe, VP of marketing at mophie. "While it's important to promote mophie's uniqueness as a brand and benefits of our products, having the opportunity to prominently showcase these amazing animals is the biggest reason we returned with the Foundation. And in doing so, we knew we had to kick the spectacle up a few notches." You can check out the St. Bernard pups in action below. They clearly worked very hard - and enjoyed all the attention.